Your feet bear the weight of your entire body and allow you to walk, run, climb, and more. There’s no wonder why they’re tired! Even though they provide us with the ability to move, they are one of the least pampered parts of our body. It’s important to pay attention to your feet so you keep them strong, flexible and healthy. 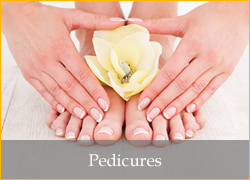 One of the best ways to do so is with foot massages and reflexology, and that’s where we’re here to help! Reflexology is a branch of Chinese Medicine and is an ancient healing practice based on the principle that there are a myriad of reflex points on the feet that correspond to different organs and glands in the body. Regular foot massages and reflexology help to promote physiological and physical health through a therapeutic process where pressure is applied to predefined reflex zones in the feet. 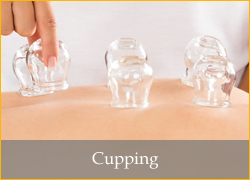 This pressure stimulates the nerves in the body that relieve tension, improve healing, and increase blood circulation that helps to promote the natural function of the related areas of the body (in addition to feeling great!). Experiencing a foot massage and/or foot reflexology in our Coral Springs/Parkland Spa will allow you to improve feelings of general well-being, in addition to creating more awareness about how you care for your feet. Regardless if you have a more sedentary lifestyle due to work, or you are able to get in the recommended 10,000 steps per day, tight footwear hampers the blood circulation in the feet. Treating yourself to a massage or reflexology helps to transport oxygen to the body’s cells, which assists in relieving body pain and promoting overall health. You are invited to pamper your feet, relax your mind and body in our spa-like environment, and enjoy the lasting benefits of massage and reflexology that include sleeping better and experiencing less aches and pains. 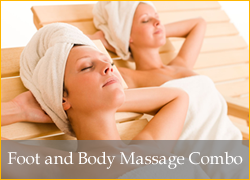 Our highly qualified team members look forward to helping you put your feet up and relax. We look forward to hearing from you! A welcome treat for tired feet. 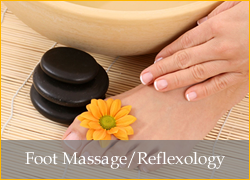 Enjoy an herbal foot soak with massage/reflexology. Your hands, neck and shoulders get ample attention too. With hot stone and paraffin treatments. 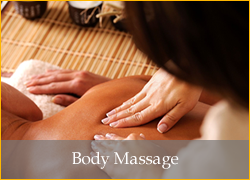 We begin with a relaxing herbal foot soak and gentle massage of hands, arms, shoulders, neck and scalp. Your foot massage follows, then a warm paraffin dip to smooth your feet, a back massage, and the comfort of warm towels complete this soothing journey. Available in 60 minute sessions. 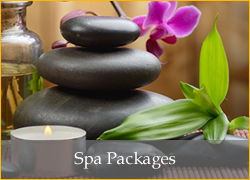 Combines the very best of our treatments plus an extra ten minutes to enjoy them. Along with the additional time, Heavenly Footopia provides all the features of Deluxe (above) plus a fragrant exfoliating sugar scrub. When you're ready to let your feet know just how much you appreciate them, this is the ultimate way to do it. Available in 70 minute sessions. VIP Private Room Available. Couples Receive Complimentary VIP Room When Available.